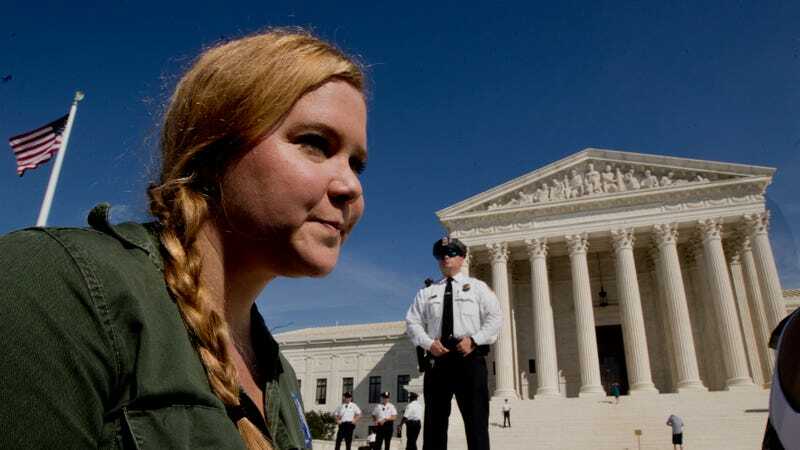 Friends and actors Amy Schumer and Emily Ratajkowski were arrested along with hundreds of other women in Washington, DC on Thursday during a protest over Brett Kavanaugh, who sure looks like he will be confirmed to the Supreme Court this weekend. During the protest, Schumer and Ratajkowski, who were both in this year’s I Feel Pretty, stood with Senator Kirsten Gilibrand as she spoke to the crowd outside the Supreme Court. Gilibrand said the thing I have been saying to my friends and family all week, what you have maybe been saying to your friends and family all week, which is that the FBI investigation into the sexual misconduct allegations brought against Kavanaugh was always going to be a sham. Gillibrand told protesters that the FBI had not taken their investigation into Kavanaugh seriously. “It was not intended to get to the bottom of this. It was not intended to find the truth. It was intended to be a cover, a cover for those who don’t want to look at the truth,” she said. According to CNN, authorities say they arrested roughly 300 people at the protests. Many were given wristbands instead of zip-ties or handcuffs. Schumer told a reporter from The Hill that hers were “for drinking,” which is probably what I would say in that position, too.